At 1.00pm on Sunday 10 March Bishop Paul will be celebrating the rites that call our catechumen (non-baptized) and candidates (baptized in another faith tradition) to the Easter sacraments. This is not a Mass. All are welcome to come and pledge their support to those journeying to full initiation in the Catholic Church. Noticing God’s Presence: Mary Catherwood RSM Tuesdays 12 and 19 March 10.30 - 11.30am (Cuppa available prior to 10.30) Reflection starters, scripture and sacred music invite participants to experience ways of settling into silent prayer. Prayer session ends with an opportunity for brief sharing or listening. 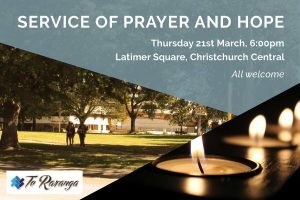 Venue: Te Manawa Atawhai Catherine McAuley Centre at Villa Maria College. A Mass to commemorate the opening of the Church on 20 March 1994 will be held at 9.30am on Sunday 17 March 2019. The celebrant will be Bishop Paul Martin SM.. A morning tea will follow at the Marist Rugby League Rooms. Note Your Diaries. AN INVITATION to a time of stillness and silence before the Blessed Sacrament, every Tuesday of Lent, 5.30 - 6.30 at St. Mary’s pro-Cathedral. Come for a few minutes or the full hour. 5.30pm Adoration of the Blessed Sacrament, 5.50pm reflection, concluding with Benediction beginning at 6.20.. Formation for LEADERS - Tuesday, 19 March 7-9:00pm, Catholic Education Office, Registration at mdaly@chch.catholic.org.nz, 03.353.0758 by 12 March. New & experienced leaders welcome. Come learn what the Church envisions for her children. 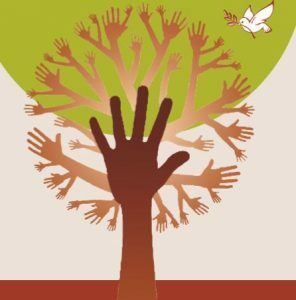 Caritas Aotearoa New Zealand, the Catholic Agency for Justice, Peace & Development is celebrating 50 years of ‘love in action’ this year and to mark this wonderful milestone there will be an anniversary Mass at the Pro-Cathedral at 10.30am on Sunday 24th March to which you are all warmly invited. The Cathedral Parish is organizing a Time of Renewal, Rosary – Adoration – Reflection - Movie “Jesus of Nazareth”... the passion of Jesus. Bring along family members and friends. Everyone is invited. Join for a cup of coffee after the programme. Saturday, 6 April 2019. From 1.45pm to 3.15pm at Cathedral Parish, 373 Manchester St. Your presence will be much appreciated. Presentation by Fr Michael Pui. 7.15 pm Wednesday, 10th April, St Gregory’s Centre, 30 Cotswold Road, Bishopdale. Prayer, gospel reflection, praise singing, formation and friendship. Come and join like-minded Catholic men to grow your faith and be encouraged in your walk with the Lord. Every second Wednesday of each month. More information? Phone Chris on 027-646-4138.